Live analog TV in a voice bandwidth! This suite of programs enables low and modest resolution B&W and colour TV images to be transmitted at modest power, and received via a limited performance HF radio channel. The system has been optimized for specific radio conditions; there is a version for NVIS conditions (such as the Amateur 80m band at night); another with better resolution, more suited to higher bands; and a special fast version for VHF. The pictures are easily tuned with practice, and can be recorded and replayed using software provided. OFDM NBTV is an analog technique, in fact it is a true Fuzzy design as well. The transmission technique used is quite different from conventional TV - each line is transmitted separately, but all lines are sent at the same time, on a slightly different frequency. Because the transmitter and receiver operate at precisely the same speed, controlled by the computer sound card, there is no need for any sync pulses to align the picture; in fact there is no automatic synchronizing mechanism at all - it simply isn't necessary. Modulation on each of the many carriers is very narrow FM (a few Hz), for best noise rejection, and the overall transmission bandwidth is only 2kHz, so an SSB transmitter and receiver can be used. These modes are Fuzzy Modes, which means that although the computer samples the images for transmission and display, the signals are essentially analog in nature, and at the receiver the images are presented without decoding decision or intepretation by the computer - they are interpreted by eye and brain at the receiver. This means that the signals are inherently very noise immune and continue to be useable despite interference and propagation effects until they fade into the noise. The design is very versatile, and you can use still photographs (like a slide show), moving GIF images, AVI movies and many different types of live video, including 'web cams', video capture cards, digital cameras, screen shots from other software, and even live (fast scan) TV, although only one frame in many is transmitted in this case. A 'drag-and-drop' technique makes all this very easy. Because of the low bandwidth, it is not possible to send moving pictures in real time. Each image frame takes from one second to nine seconds to transmit, depending on the mode used. However, the received signal can be recorded and later played back faster for a very realistic effect. Standard .AVI format files are used, and the transmitters can also retransmit previous recordings. The images can also be post-processed for noise reduction and smooth motion effect. The quality of moving images is such that you'd never believe that the pictures contain only 48 or 72 lines! On lower HF bands, especially with NVIS conditions (strong fading and multi-path reception), performance suffers as noise and colour stripes invade the picture. The 96 x 72 pixel colour mode is most affected. However, on the higher bands and VHF, the pictures are superb. Another limitation is that tuning requirements are fairly stiff - you CANNOT use a VFO rig - it simply isn't stable enough. Most modern synthesized transceivers are OK if used with care. Tuning needs to be within 1Hz of the transmission. On VHF the secret is to use FM transceivers, and thus avoid the problem completely. There are in total five modes, two black and white, and three colour. 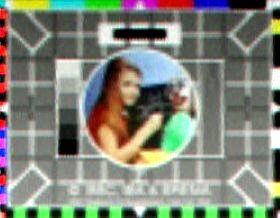 There is some compatibility between the B&W and Colour modes, so you can soon work out which is being transmitted. There are two different image resolutions, 48 x 48 pixel low resolution (which is faster and more robust), and 96 x 72 pixel modest resolution, which of course is slower, but gives more picture detail. A special compressed 96 x 72 pixel colour-only version is provided - this provides a frame rate twice as fast as the standard 96 x 72 colour mode, but is suited only to higher bands and VHF. The picture on the right below shows typical 48 x 48 colour reception. In this mode, there are 48 carriers, spaced 42Hz apart, one carrier for each picture line. The total signal is therefore about 2kHz wide. This includes a 'pilot carrier', transmitted in the middle of the image carriers (see picture above). This is slowly sine-wave modulated, and used for fine tuning. In the B&W option, just one field is transmitted per frame. With 48 pixels per line, each pixel takes 20ms to transmit, and the carrier modulation bandwidth is about 40Hz. At the end of each line a vertical dotted line is transmitted, so the end of frame can be identified. In colour mode, three separate fields, much the same as described, are transmitted for Red, Green and Blue image data. At the end of the third (blue) field of the frame, a vertical dotted line is transmitted, so again the end of frame can be identified. In this case it also identifies the correct colour order (you can see this line at the left of the picture). The picture has a square (1:1) aspect ratio. This mode uses 72 carriers, spaced 32Hz apart, again one carrier for each picture line. There is one 'pilot carrier', right in the middle of the picture carriers. The pixel modulation rate is lower, and so the carriers can be closer together. The total signal bandwidth is also about 2kHz. In the B&W mode, just one field is transmitted per frame. There are 96 pixels per line, and each pixel takes 30ms to transmit. As in the 48 x 48 modes, the end of each frame is identified by a vertical dotted line. In colour mode, three separate fields are transmitted for Red, Green and Blue image data. At the end of the third (blue) frame, a vertical dotted line is transmitted, so again the end of frame and correct colour order can be identified. The picture has a standard TV (4:3) aspect ratio. This mode is only in colour, and has the same modulation characteristics and picture size as the 96 x 72 modes. The difference lies in the coding technique. In order to speed transmission, an interlacing technique is used, where only two fields are transmitted per frame. One contains odd and even green lines, while the other contains (on odd lines) averaged red data from odd and even lines, and (on even lines) averaged data from blue lines. Thus the vertical resolution of green data is twice that of red and blue. Since the eye is more sensitive to green detail, this RGGB technique is a good compromise. The advantage of this mode is that is has a higher frame rate than the 96 x 72 RGB mode (6s/frame rather than 9s/frame). The disadvantage is that the images are very poor when used under conditions of variable propagation, as very strange colour interference fringes are generated. The mode is ideal for VHF. The ITU 'Emission Designation' for all these modes is 2K10F8FNF or 2K10F8FMF (suffix NF for colour, MF for B&W). Software can be downloaded free from this website. It is designed for Windows™ 98 and Windows™ XP. At present there is no software for other operating systems. A Pentium™ 500MHz or better computer is required. A USB web-cam or TV receiver/video capture card is required for live pictures. Example Analog NBTV transmission (A48-NBTV.avi, 886kB). 48x48 pixel colour transmission, captured on 80m, 500km range. Example Analog NBTV transmission (A96-NBTV.avi, 668kB). 96x72 pixel colour transmission, captured on 80m, 500km range. Copyright © Con Wassilief and Murray Greenman 2004-2009. All rights reserved.